Today I am featuring Codex, Izzie's, Lakshmi and Renegade @ Tropical Summer Fair. Plus furniture from unKindness @ Lost & Found and Persnickity. 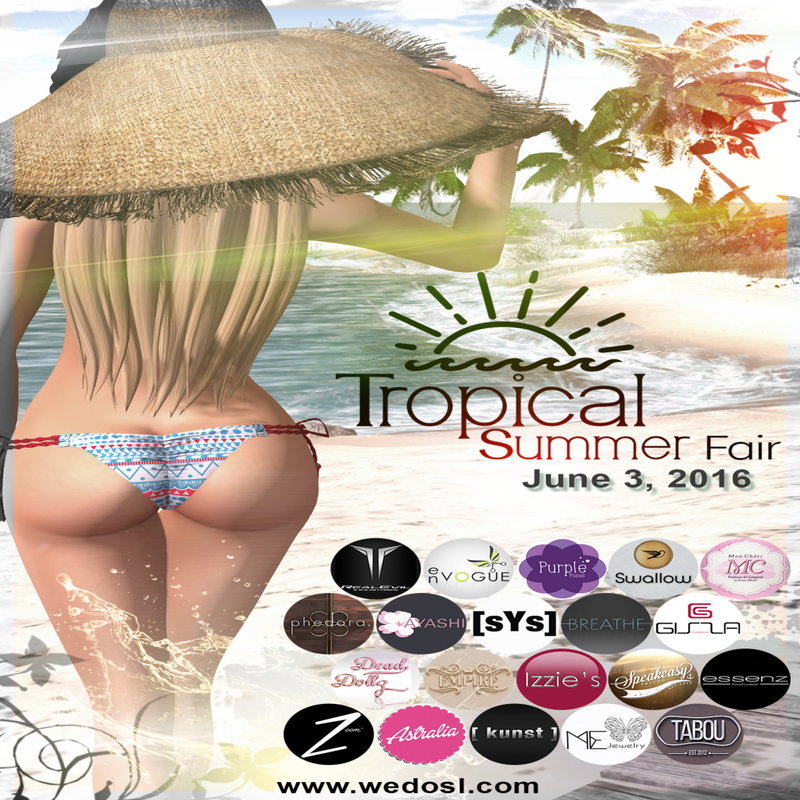 We are taking our first look @ Tropical Summer Fair, opening on June 3, 2016. TSF is presented by We Do SL Events. For full information, check out their website. This sassy summer event will feature some of the hottest designers on the grid. Today I am wearing necklace from Codex, bracelets with color HUD from Izzie's and a cute lil summer dress from Lakshmi. Each dress color pack comes with three different colors. They come in Slink, Maitreya and Fitted mesh sizes. The shoes, for Slink, Maitreya and TMP are from Renegade. All these goodies can be found @ Tropical Summer Fair from June 3. I am pictured with some fun items including the croquet set from Persnickity. These items are decoration only and include; croquet stand, mallet, wicket, ball and stake. The hanging tapestry is available @ Lost & Found by unKindness. They're suitable for indoor our outdoor use. I hope you enjoy today's summery look.